The Bangala, Chettinad: Heritage Haven in Historic Tamil Nadu! Featured several times in the New York Times, the hotel occupying a house that turns 100 this year has redefined ABC. In Chettinad “A” stands for Achchi or the grand-dame Mrs. Meenakshi Meiyappan who owns The Bangala, which “B” designates, whilst “C” can only signify the celebrated Chettinadu cuisine The Bangala upholds with unmitigated zeal. Achchi (meaning grandma) which Mrs. Meiyappan is unexceptionally called, runs the hotel as an extension of her home, which means you sometimes concede the professionalism of a hotel to the charming idiosyncrasies of local staff (who seem to have been around as long as the 100-year-old edifice) muttering in Tamil. The Bangala isn’t a boutique hotel. Nor a home-stay. It’s an experience. What makes for its uniqueness is the inimitable Mrs. Meiyappan. I’d call her a veritable “character” but the epithet would seem indecorous applied to a remarkable lady who inspires veneration, even awe. Let’s just say she’s a personality. She’s eccentric and endearing, eloquent and engaging, but also sharp and shrewd. Entrenched in tradition and indomitable in her opinions, she isn’t to be argued with. She’s a most gracious hostess and if sometimes she seems irked, I suspect it’s a bit of pantomime and part of her persona. She’s also persnickety in the extreme. And runs a tight ship. At 83, mind you. But when she smiles coyly, you think she could be 16. She seems timeless. The first thing you notice about The Bangala (apart from the front veranda propped on those famous Chettinadu pillars) is that the entire front office is manned by women, something Mrs. M is extremely proud of. 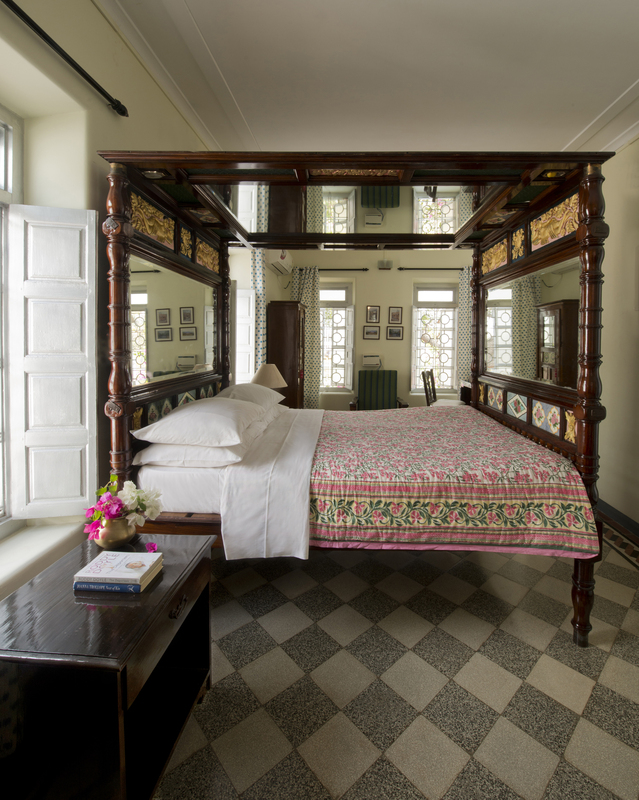 You don’t “check in” as you would at a hotel but chitchat with Mrs. M who sits at a small desk surrounded by family heirlooms, “From Burma,” she eexplains. She’s a Chettiar, and that’s the community of Tamil merchants with a tradition of embarking to faraway lands to trade and fetch exotica that ornament their fabulous Chettinadu palaces. But not before lunch, a ritual over which Mrs. M presides, gracing each table in turn, like a butterfly dispensing her charisma. She accompanies me to lunch in a pillared pavilion. Before me is a garden embowered in a massive jack fruit tree; behind me is a wall tessellated with those celebrated Raja Ravi Verma paintings. 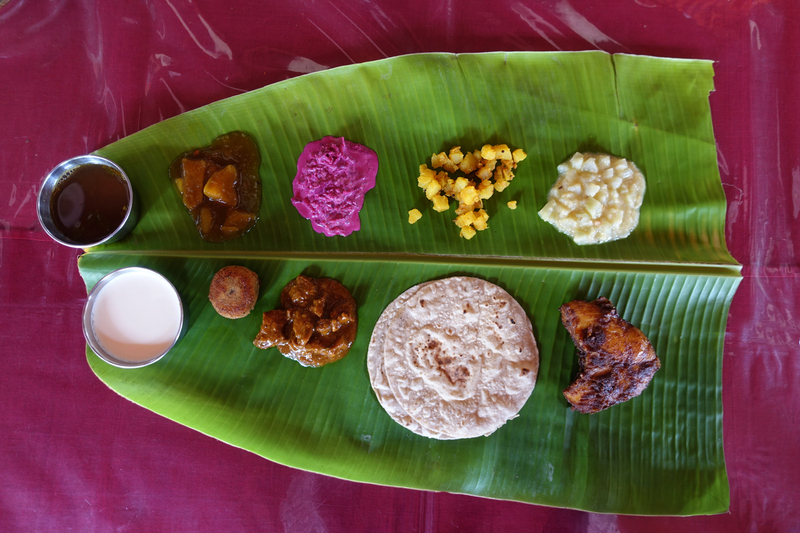 On the table unfurls a banana leaf soon to be a mosaic in flavoured rice and curries of magnificent hues and compositions, with names as tongue-twisting as the pickles are tongue-tickling. It’s the first time I’m having a ladies finger mandi. It’s supposedly healthy. Less healthy is the rich almond halwa dessert laden with clarified butter. But I don’t decline seconds. Suppers could comprise Chettinadu speciality kuzhipaniyaram (porous little deep-fried rice dumplings) and delicate dosas served with varietal chutneys. There’s homemade coffee ice cream to finish. Mrs M won’t leave until the last guest has. And whilst hosting me, she has a vigilant eye cast on a group of boys having rather too much beer at the adjoining table. She is distinctly displeased and eventually strides over to their table. Most hotels wouldn’t dispute your capacity to drink, provided you didn’t misbehave and settled the bill. But The Bangala isn’t a hotel. Someone observing the episode smiles and says it’s sometimes like a boarding school. It is Mrs. M’s home and you need to respect house rules. For instance, chauffeurs cannot enter rooms you’ve paid for. Incidentally, the rooms are in different styles in the heritage and art deco wings. The new pool wing launches for Christmas. The foreign guests get dressed and are delighted at the ever more ceremonies, culminating in the actual wedding with customs whose significance nobody understands but nevertheless perform mechanically with the unimpeachable: “It’s our tradition.” Things proceed as per stringent tradition until the most revered senior members of the family are called upon to bless the couple, which involves the execution of further rituals. The group of foreign guests throw themselves in with the elders and perform the rituals willy-nilly as the family watches aghast. It’s as if the priest at a Christian wedding had said, “You may kiss the bride now,” only to find invitees lining up, too. The family, of course, with consummate Chettiar grace, say nothing. Mrs. M is astonished when I relate the incident. An honoured member of Chettiar society that she is, even she doesn’t take it upon herself to impart unsolicited blessings. “We always respect other cultures.” Western guests sometimes in their enthusiasm violate the sanctity of profoundly conservative Chettiar culture in which arranged marriages are still the norm. I certainly am stunned when the groom’s seven-year-old cousin, asked if he’d prefer to find his own bride or have an arranged marriage, remarks without flinching, “Arranged marriage, of course.” His father finishes, “This is our culture.” And it survives because it’s unquestioned. 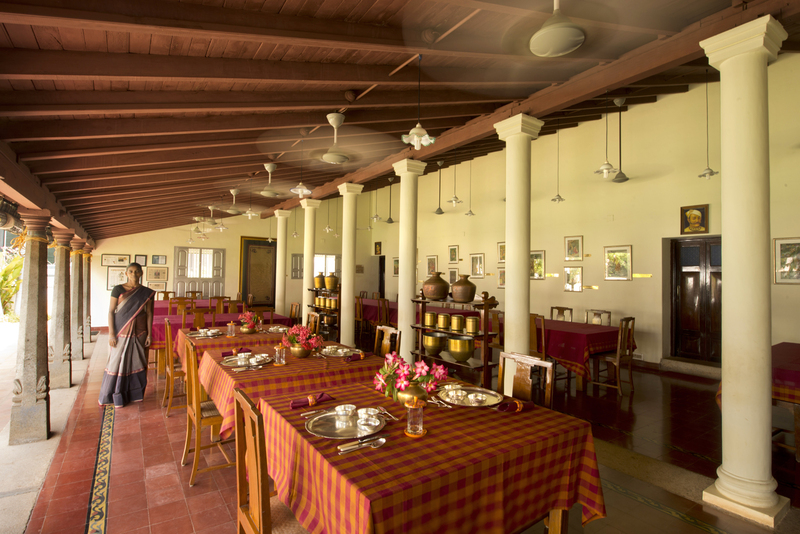 Mrs. M prides herself as much on the Chettiar’s discipline as on Chettinad’s culinary culture and conducts cookery demonstrations in a pretty gardened pavilion adorned with exquisite antiques from the famous local antique market. There are superbly crafted brass lamps and a majestic brass urn. I want exactly that. Mrs M asks me not to talk nonsense. It weighs a ton. But I’m enchanted by this collection of antiques, much to Mrs M’s dismay as I shall spend five hours every afternoon for the entire week I stay excavating the antique market, where, incidentally, you might find some suspect sculptures shorn off temple walls and temple chariots. You’d be advised to buy from the reliable Raghavendra Arts. In additon to the Karaikudi antique market, Chettinad and its environs abound in attractions. Chettinad’s historic palaces alone would consume a day. Mrs M’s family owns a few, possibly the most majestic ones, and they are open to her guests. Her ancestral home is a 200-year-old masterpiece of Chettinadu architecture and craft, with intricate carvings in Burma teak. Elaborately sculpted wooden doors studded with ornate brass knockers and vast inner courtyards with an enfilade of Chettinadu pillars are the distinguishing features of a typical Chettiar house. Rooms line the courtyard, which makes for a wonderful arrangement, as sunlight streams in, naturally illuminating these immense airy homes. If you removed all the Burma teak in Chettinadu palaces, you could fill an entire forest. Athangudi tiles are another celebrated Chettinadu craft. They stream in a chromatic pageant around historic houses like the one Mrs M currently lives in. She arranges visits to an artisanal workshop. 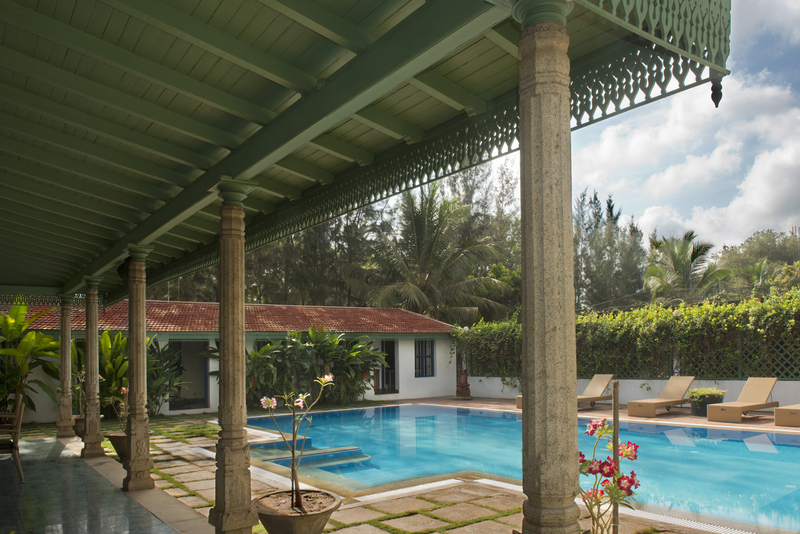 which furnished the beautiful blue tiles she has used to floor The Bangala’s pool pavilions. At the workshops you can customise tiles, and many travellers enjoy playing around with form and colour to create their own tiles, which are then shipped, often to America. 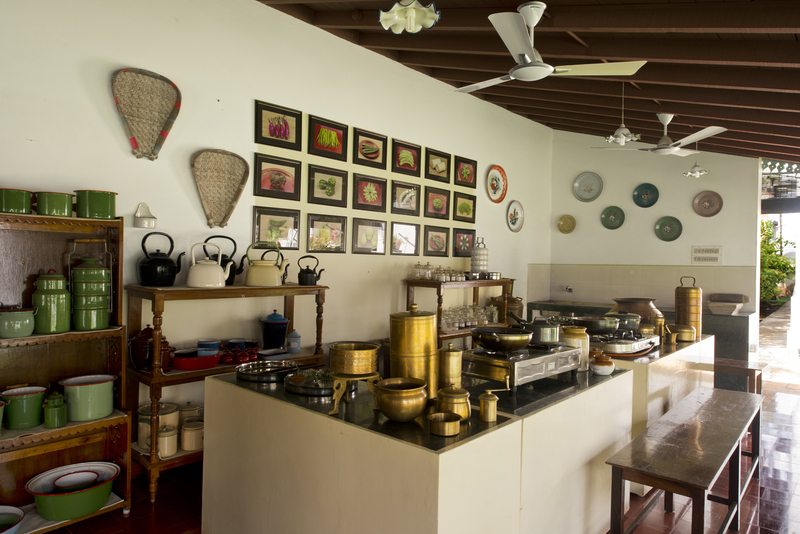 Chettinad is also renowned for Karaikudi cotton sarees and crafted pots in brass and copper. Mrs. M also takes me along to see the fabrication of terracotta horses destined for forested temples, where they are placed in fulfillment of vows. There’s a graceful terra cotta horse that greets you in her front garden at The Bangala. 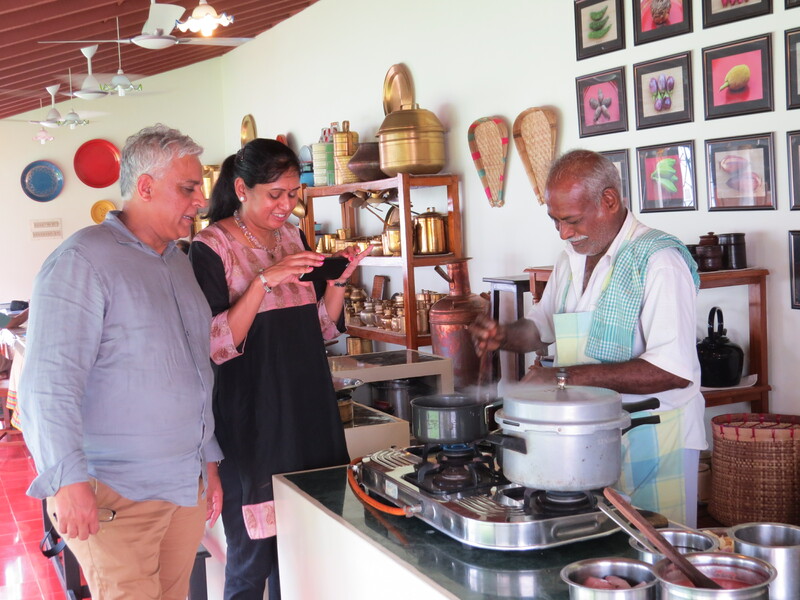 There are terra cotta garden and cookery pots, too, and you’d be advised to pick up the latter as food is healthier and tastier when cooked à la Chettiar tradition in clay and brass utensils. The Thirumayam Fort fascinates , for it has a shrine in an elevated cave with a Shiva Linga (phallic depiction of Lord Shiva) projected within, and you can see it either by climbing the rock or from an incline opposite the shrine. But Mrs. M is more intrigued by the young lovebirds who have taken the romantic spot and who obstructed my access to picturesque nooks, ensconced and entwined as they were in strategic spots. “What were they doing? Making babies?? !” Mrs. M enquires, alarmed. Outside the fort are two old and amazing temples. But the temple of great historic stature is the one in Rameshwaram, about an hour and a half away. It’s a beautiful drive and would thrill any nature lover, for you pass streaming verdure, which suddenly strikes stretches of white sand streaked in pristine blue waters. “The entire biosphere around Rameshwaram is stunning,” Mrs M confirms when I speak of the marvelous sites I’ve seen. The temple itself is legendary, for it is supposedly here that Lord Rama in The Ramayana epic worshiped Shiva before he embarked from Dhanushkodi to Lanka to fetch his wife, which the demon king Ravana of Lanka had abducted. Dhanushkodi is amongst the most astounding places you’ll see. Unless you have permission to take your own vehicle, you must take a rickety coach that seems to sink in the soft sands until you reach the delightful Bay of Bengal, where hawkers strew the beach with gorgeous pearl jewellery. We next reach the boisterous Indian Ocean on the other side and a local boy says: “Unlike the sweet Bay of Bengal, this ocean will gulp you up,” as gigantic waves come crashing towards us, almost toppling me over and sucking me in. The locals say poetically: “The Bay of Bengal is like the female principle and the Indian Ocean, the male principle.” Where they meet captures the Shiva Linga penetration of the vaginal yoni (symbolic ring around the linga). A terrific site, but denied me for Sri Lanka is only 18 kilometers away but is now inaccessible because traffic is rampant. Surprisingly at this most sacred of places to Hindus, you see no temple, but only churches and mosques. The Bangala can also be the base from which to explore Tamil Nadu’s temples. You access Chettinad by one of two airports: Madurai or Tiruchirappalli. The latter boasts the Ranganathaswamy Temple, with the long reclining statue of Lord Vishnu on a snake. But I prefer the staggeringly beautiful Meenakshi Temple in Madurai, which is luring many tourists who say it is architecturally more phenomenal than the Taj Mahal. Some now say it’s the most incredible thing they’ve seen in India. A week in Chettinad doesn’t suffice, for there is so much to do. Mrs M can also fix you up with an astrologer; regulars who’ve consulted him for 20 years claim heis 99% accurate–at least. Well, I have just one question for him: When can I return to Chettinad? !